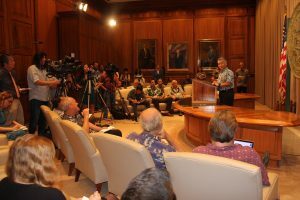 Despite the controversy over O‘ahu’s rail project, the Legislature did approve a budget to keep the state moving forward — including funding for many top priorities identified by the governor and state agencies. This issue of Capitol Connection recaps some of those actions and the governor’s comments in a May 3 news conference. Q. What do you want people to know about the 2017 legislative session? A. It’s easy to focus on the differences, but we also saw a lot of agreement on important issues such as education, affordable housing and homelessness, and sustainability. This session was unusually challenging because after we submitted our executive budget, the revenue projection ended up being $800 million less. We also entered into negotiations with the unions for 14 new contracts and have settled most of them. I got personally involved in the teachers’ union negotiations because it was a priority for me to see a settlement before the June 30 deadline. Having that uncertainty wasn’t good for our schools, teachers or students. Q. Out of the programs funded, what were some of your top priorities? A. I thank the Legislature for supporting the Early College initiative in our high schools and the new Hawai‘i Promise program in the UH community colleges to help students cover the gap between what students can afford and college costs. We continued our commitment to affordable housing, the Department of Hawaiian Home Lands, public housing and more funds to help the most chronically homeless statewide. We also increased support for invasive species response and funding to help us move forward in food production, water systems and loans to new farmers. We also have funds to address traffic congestion and the Maui Health System transfer. Q. Where do you stand on the current controversy over rail funding? A. While I support the rail system, I have the same frustration as the Legislature when two years ago the mayor promised it would be the last time they would be asking for more money. When you ask questions of the Honolulu Rapid Transit people, they don’t have real comforting answers. What have they done to manage costs? I said a year ago that I think we need to look at a combination of funding — federal, county, state and private funds. Most other transit systems have funding from private development. Both the House and Senate had legitimate questions about the project to make sure costs don’t keep escalating. Q. What do you think of President Trump’s approach to the federal budget? Threats from North Korea? A. It’s fortunate our Congressional delegation was successful in protecting those federal programs most important to Hawai‘i. Trump will try to cut some programs again in September, but he’ll need bipartisan support. Regarding North Korea, I do think it’s a real concern we need to plan for. We’ll be working with the U.S. Pacific Command to ensure that the people of Hawai‘i are protected. Q. Why was the recent Japan-Hawai‘i Economic Summit held in Kailua-Kona significant? A. This is the first time we have hosted such a summit. Our relationship with Japan continues to thrive because it’s rooted in our historical, cultural and business connections. We want to find new ways to build on that solid foundation with increased tourism, trade, student exchanges and clean energy projects for mutual benefit. (See story on HERE).